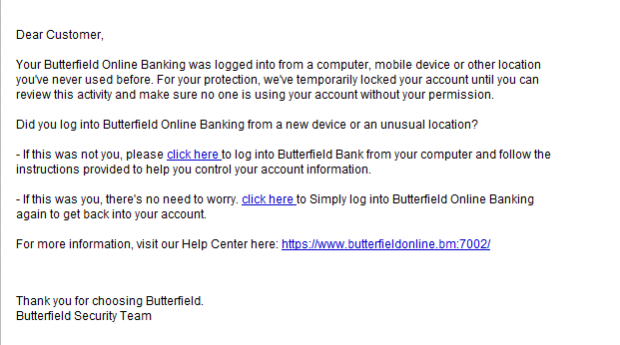 An email [shown below] purporting to be from the Bank of Butterfield has been sent out to local email addresses, claiming accounts have been temporarily locked for security reasons. A spokesperson for the Bank said, “Butterfield advises our customers that we will NEVER ask them for personal information or account details via e-mail or use e-mail to direct them to a website to “update” or “unlock” their online access. There is one I get twice a week which is supposedly from HSBC. They even ask for all the credit card numbers. I put in expletives for all the usernames and passwords – the most disgusting words you can imagine – then I press send. Your Butterfield Online Banking was logged into from a computer, mobile device or other location you’ve never used before. For your protection, we’ve temporarily locked your account until you can review this activity and make sure no one is using your account without your permission. Did you log into Butterfield Online Banking from a new device or an unusual location? - If this was not you, please click here to log into Butterfield Bank from your computer and follow the instructions provided to help you control your account information. - If this was you, there’s no need to worry. click here to Simply log into Butterfield Online Banking again to get back into your account. Thank you for choosing Butterfield. The Information contained and transmitted by this E-MAIL is proprietary to Butterfield and/or its Customer and is intended for use only by the individual or entity to which it is addressed, and may contain information that is privileged, confidential or exempt from a disclosure under applicable law. If this is a forwarded message, the content of this E-MAIL may not have been sent with the authority of the Bank. shall not be liable for any mails sent without due authorisation or through unauthorised access. If you are not the intended recipient, an agent of the intended recipient or a person responsible for delivering the information to the named recipient, you are notified that any use, distribution, transmission, printing, copying or dissemination of this information in any way or in any manner is strictly prohibited. If you have received this communication in error, please delete this mail and notify us immediately at info@butterfieldonline.bm. this is mugness like chaboy Prugness!